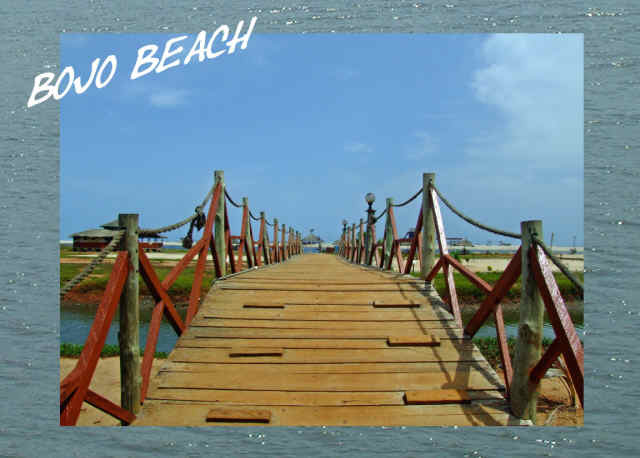 Bojo Beach Resort Bojo Beach Resort, one of Ghana's tourist attraction centres, has, since its establishment, maintained its image as one of Ghana's best beach resorts. Bojo Beach is a short drive from Accra and its location is ideal for vacations, business meetings, parties, among others. Stroll lazily along the soft sand, and enjoy the sun-wreathed waters of the Atlantic Ocean. Boasting several amenities and still improving the facilities to cater for its ever-growing clientele, Bojo Beach Resort, located along the Accra-Cape Coast road past McCarthy Hill and just 40 minutes from downtown Accra, immediately envelops visitors in natural splendor. One needs to organise a family trip to Bojo Beach Resort and experience refreshment within an exceptional setting. At Bojo Beach one can easily allow the stresses of yesterday to melt away beneath the warm sun. The beach resort has seen ongoing systematic growth which has enabled it to establish a reputation that attracts tourists seeking a place for relaxation. Bojo Beach Resort has become an important landmark in the capital and has also become a beach resort of choice for relaxation by various personalities. Clients maintain that there is always something new when you visit this paradise. On arrival guests are received by a warm and courteous staff while ample parking space with security is also available. The red brick building is equipped with a conference room with a 200 sitting capacity, a bar, restaurant and a game area that offers a variety of games including pool and table tennis. A certain homey feeling grips visitors as they commune with nature in a sailboat or canoe as they drift between the conference center and the beach which is about 200 yards away. The beach is an island that contains a huge straw hut and a bar. It also has a public restroom with showers. After being ferried to the beach patrons have options to rent lazy chairs and umbrellas. After that they can order drinks from the professional staff who are dedicated to ensuring that your glass is never empty if so desired.